Getting ready for the Spring Football season to wrap up, the Coaches speak for the top 25 Basketball Poll for the season, and the campus gets ready for the Spring Game which might be the Spring swim if the weather reports hold. 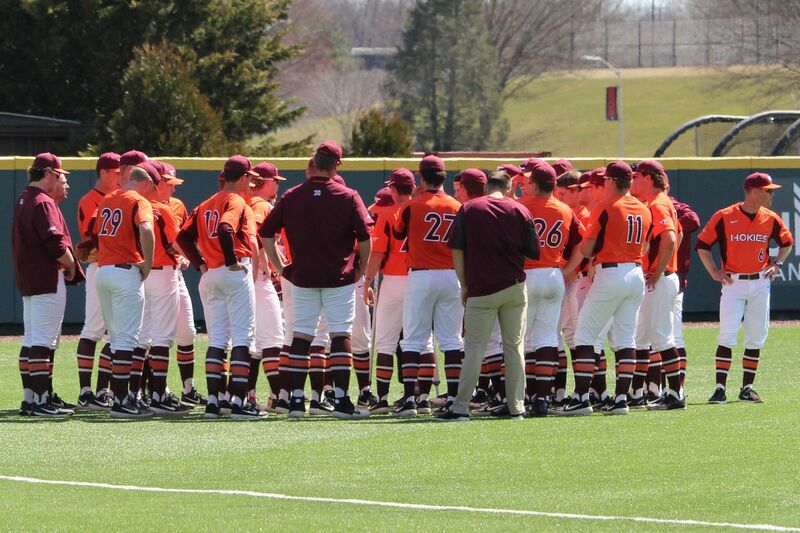 The Baseball Team talks over strategies before a UNC game. It’s getting really quiet. We are about a month and a few days from Spring 2019 commencement and there are lots of sports that are beginning the process of wrapping up their seasons to head into exams, get ready for Summer jobs and training. The big news for the week was, of course, the hiring of Wofford’s Mike Young as the new Men’s Basketball Head Coach. We’ll be tracking that move with anticipation because, well, the team is Kerry Blackshear Jr. and some young men that we really haven’t met yet. We’ll keep you up to date on the staff hirings and any new recruits that look like they are going to be impactful. We finish No. 14 in the country, our highest ranking in the final poll in school history! It’s pretty special for a team that functionally no longer exists. We’ll see how the transfer portal treats some of the players, and we still have to hear from KBJr. Coach Young doesn’t seem to be wasting a whole lot of time, and with the recruiting time wide open he really doesn’t have any to waste, either. This one is going to be weird. That’s the word for it, weird... There is an open concern about the condition of some of the players on some squads, so Coach Fuente is trying not to get guys crippled up before the last few practices and the Summer break. Saturday will be a HUGE day at @Virginia_Tech will lots of talent on campus, plus a host of other events. The university and athletic department are really serious about this event. There will be recruits, a big Family Day event series, and the game is even scheduled for 4pm instead of the usual 2pm. The coach hasn’t really decided on what the “game” will look like. From what I can tell we are looking at more of a controlled scrimmage where there isn’t really a game clock, more like a situational setup. Like 10 plays to score from the opponent’s 30, or a 1st and goal on the 3... that sort of functional practice that we haven’t really seen in the Spring, all that much. Here’s a snip from Twitter on the Quincy Patterson II piece of the presser. The quarterbacks are going to get pushed hard for the session, at least that’s what we keep hearing. In past years the plays were limited and the challenges not really all that heavy. The offense was handed very basic play routines and not much was learned by Hokie Nation as to who was trending higher than whom. Needless to say we are all chasing the potential of very wet. I can tell you first hand if it’s raining, there’ won’t be any field pictures. My old Canon was humidified to death at the Military Bowl game, and my new T6 isn’t going to suffer the same treatment. We’ll be looking at solutions for getting camera equipment out on the field in the wet, but suffice it to say the equipment that we can afford is not the stuff that the big boys can. We haven’t heard the word about our credentials, and even if that sort of slides through the cracks we’ll be covering some how. The Softball Team will be playing UVA this weekend. The team is ranked 20/22 this season. We move up two spots this week to No. 22! That’s one of these in my book. Maybe we can sneak over to the field some afternoon or weekend and check in with a few pictures. Trull hits a two-run homer to right!